Royal Porto Real All Suites Resorts is located on finest stretch of white sand beach and one of the most beautiful areas in Playa del Carmen, just across from its popular sister property Gran Porto Real Resort & Spa, offering privacy and comfort yet minutes from downtown and everything this exotic destination has to offer. Weddings at Real Resorts are Splendid! Aquamarine waters and powder-soft white beaches, making you completely happy. Basquet of fruits and bottle of sparkling wine in your room. Bottle of sparkling wine during the ceremony. Decoration with petals on your bed. Bathrobes in your room for use during your stay. Breakfast in bed on first honeymoon day. If your wedding involves beautiful scenery and a romantic hideaway, Real Resorts has the Perfect Fairy tale wedding waiting for you. we haven't had a bride at that resort yet but from what i've read it is a grat place to get married...have you gone for any site visits yet? No, and thats kind of my problem, I can't make it down there at all before, and I think I am leaving it kind of late to book for late March? Also liked the look of El Dorado Royale though. Just thought the Royal Porto would be a good solution for guests to wander around town to keep themselves amused? I am getting married here on July 6, 2007 and I was there on my scouting trip last July, it's fantastic! Let me know if you have any questions. The name is changing on December 26 to The Royal in Playa del Carmen, just FYI. I am thinking of getting married at the Royal also. I have been there before and it is beatiful. I highly recommend the resort and the town of Playa is great. Plenty to do, but not too much and not as "Americanized" as Cancun - it is getting more commercialized though. I am looking for firsthand info from anyone who has had their ceremony there so I have an idea of what to expect. My fiance organized a romantic dinner on the beach through the Royal and the service, food and ambience were impeccable - I would expect the same from their wedding service as well. I think is is a really busy spot for a wedding. However, there was a wedding every day that I was there on my honeymoon. We met a couple in our shuttle on the way home who had just gotten married at RPR. They loved it. She said they were very accommodating and were great to work with. Our room overlooked the wedding gazebo. It is situated in a quieter part of the resrot, but still a little busy, people were walking by periodically. But still really pretty, but just not really private. It just depends what you want. I wish I had taken a better picture. I 'm sorry...this is all I got. It was dark by the time I took the pic! 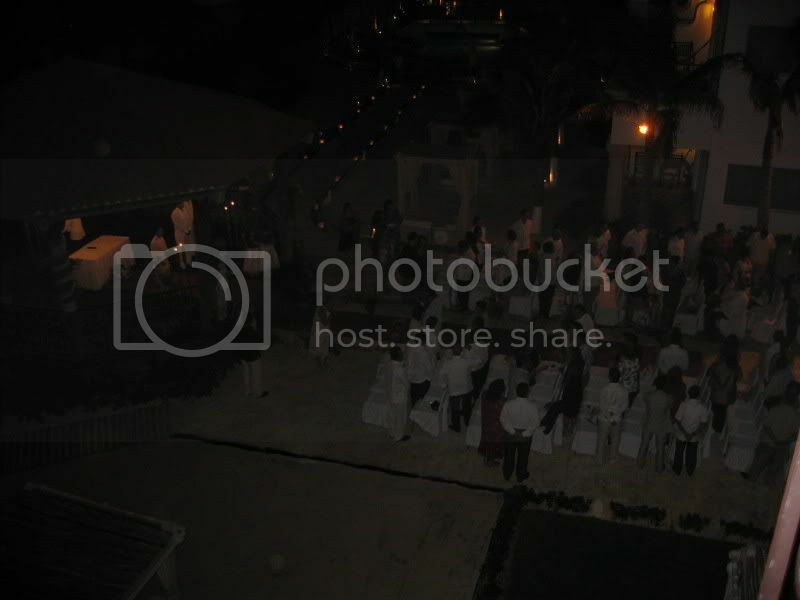 This was a huge wedding (around 200). For smaller weddings they set up the guest chairs inside the gazebo. I think it holds 20 or 30 chairs inside. How much does the Royal Porto Real cost per night? My Fi and I are thinking of honeymooning there but we don't want to spend much more then $2500. We were hoping for a 6 night honeymoon. Is it possible? ?